No, that's not another April Fool's Day joke. 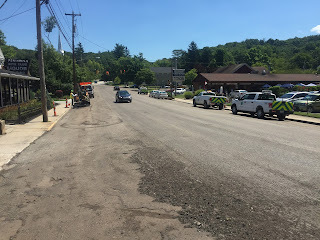 With summer construction season in full swing, we seem to be surrounded by orange barrels and cones on all sides at the Century Cycles in Peninsula, so allow extra time when traveling to our store. Work began today on the re-surfacing of State Route 303 between Interstate 271 and State Route 8. Expect lane restrictions and delays through the end of September. Take the exit for State Route 303/Hudson/Peninsula as usual. Get in the middle lane at the end of the exit ramp. At the traffic light, proceed STRAIGHT across State Route 303 onto Akron-Cleveland Road. At the next traffic light, turn RIGHT onto Kendall Park Road. Kendall Park Road becomes Truxell Road; at the end of Truxell Road, turn RIGHT onto Akron-Peninsula Road. At the traffic light in Peninsula, turn LEFT onto Main Street; we will be just ahead on the right. At the end of exit ramp, turn LEFT onto State Route 303 as usual. Get into the left-most lane immediately, and turn LEFT onto Akron-Cleveland Road at the next traffic light. Take exit 10 for I-77 South. Take exit 143 for State Route 176/Richfield. Turn LEFT onto Wheatley Road. Proceed straight at the bottom of the hill as Wheatley Road becomes Everett Road. Turn LEFT onto Riverview Road. At the traffic light in Peninsula, turn RIGHT onto Main Street; we will be just ahead on the left. Take exit 9 for I-77 South/State Route 176/Richfield. Turn RIGHT onto Brecksville Road.